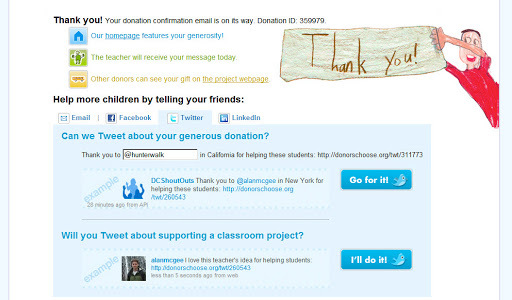 DonorsChoose makes great use of social media in their work to help teachers get their classroom projects funded via community donations. Their Twitter integration is pretty novel IMHO – you can either tweet your donation from your account, or just fill in your Twitter username to have them tweet as well. This entry was posted in charity, donorschoose, nonprofits. Bookmark the permalink. ← Iraqi Gov’t Launches a YouTube Channel!